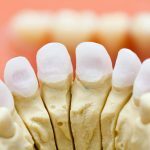 We have talked about a lot of dental emergencies throughout this site. However, when it comes to the most shocking type of emergency a knocked-out tooth is quite possibly one of the most frightening experiences you can have. 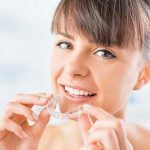 We put this page together to help you know exactly what you have to do to if you find yourself in a situation where you have literally knocked out one or more teeth. Look at this as the ultimate resource for your needs. 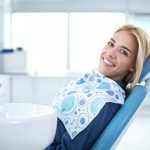 We will be talking about what some of the most common causes for knocked out teeth are, what you need to do immediately after you realize you have knocked out your tooth and how you can find immediate medical help. Let’s start by talking about something extremely important. What steps you need to take when someone knocks out a tooth. IMPORTANT: If the person with the knocked out tooth has a very serious injury or is unconscious you should call 911 immediately. 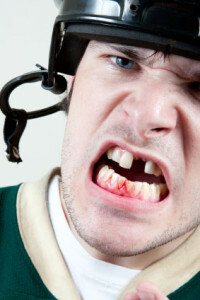 As stated above, knocking out a tooth is a frightening experience so it may be hard to think straight. However, the first step that you should take is to locate your missing tooth. This may not always be easy but do everything you can to find it. If your tooth is fragmented then pick up all the fragments and store them someplace very safe. It is also important that when you pick up your tooth that you pick it up by the crown and not the root. If you notice that the root of the tooth is dirty then gently wash it out. However, don’t use alcohol or store the tooth in water. Side Note: If it was a baby tooth that was knocked out you should under no circumstances reinsert the tooth as this could cause permanent damage. If you find that you can’t reinsert the tooth then store the tooth in whole milk or between your cheek and gum to prevent the tooth from drying. Trust us when we say that if you have lost a tooth there is going to be a lot of blood. Here are the steps you should take to prevent your circumstance from worsening. Control the bleeding with gauze. For swelling apply a cool compress. Why do we recommend that you find an emergency dentist? 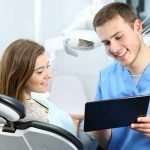 Simple, most of these types of injuries occur on the weekends when your regular dentist is close. Therefore we highly recommend that you take a look around our site and find the closest emergency dentist to your current area.